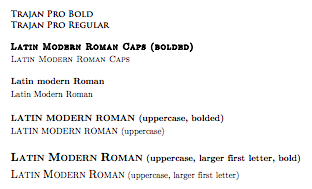 I am trying with no success to create text using bold small caps for the Latin Modern Roman font. The whole manner in which fonts are handled in TeX really confuses me, so my knowledge on any commands and ways to manipulate it are limited to \textit, \textbf, \scshape, \bfseries, the size commands, and \setmainfont. As my document is all set up for using fontspec I cannot get the second solution to work and the first solution has a severe problem of its own, which can be seen in "open type small" as the blocky looking text. So I had two ideas, one was to look for a font with bold small caps, (which I found called Trajan Pro). However I don't know how to implement it as by bold small caps font. At the end of the day I need this to work with titlesec to define subsubsections and the like. Does anyone have any ideas on how to do either of these methods? 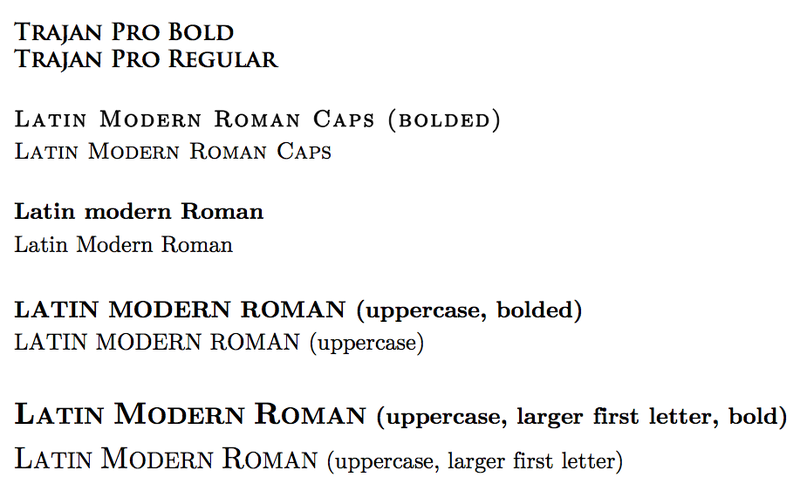 How to use all variants of Latin Modern Roman with fontspec? Browse other questions tagged bold small-caps or ask your own question. Is there a way out of my small-cap conniptions?